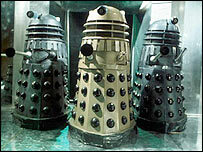 The BBC has confirmed the Daleks will not appear in its new Doctor Who series after a failure to agree terms. Talks between the BBC and the estate of late sci-fi writer Terry Nation, who created the Daleks, broke down over issues of editorial control. A BBC spokeswoman said: "After lengthy negotiations, the BBC and Terry Nation have been unable to reach an agreement on the terms of the use of the Daleks." The Terry Nation estate said it was "bitterly disappointed". The metal monsters were voted TV's most evil villains in a poll last year. Fans had hoped to see the Daleks' return in the series, scheduled for release on BBC One in early 2005, but feared copyright issues might stand in the way. The BBC spokeswoman said: "The BBC offered the very best deal possible but ultimately we were not able to give the level of editorial influence that the Terry Nation estate wished to have." But an agent for the Nation estate accused the BBC of ignoring copyright laws and said the corporation was trying to "ruin the brand of the Daleks". Agent Tim Hancock, who represents the Nation estate, said: "We wanted the same level of control over the Daleks that we have enjoyed for the last 40 years. "If the BBC wanted to re-make any of George Lucas' films, you can bet George Lucas would have something to say about it. " Mr Hancock accused the BBC of lying about the reasons a deal had not been made. He said the BBC had tried to commission a cartoon series about gay Daleks for BBC Three. He also said the corporation had allowed Warner Bros to use the Daleks in the recent movie Loony Tunes without consulting the Terry Nation estate. "We want to protect the integrity of the brand," he said. Mr Hancock said the estate would be willing to make a new deal if the BBC accepted the arrangement that had been in place for the last 40 years. Writer Russell T Davies said he was "disappointed" by the decision but it would not affect the success of the series. He said: "We are reinventing Doctor Who for a 21st Century audience with a fantastic writing team and exciting new challenges. "We are disappointed that the Daleks will not be included but we have a number of new and exciting monsters. "And I can confirm we have created a new enemy for the Doctor which will keep viewers on the edge of their seats." As Doctor Who's sworn enemies, the Daleks were voted the most evil villains on television in a vote by more than 3,000 GMTV viewers in 2003. Christopher Eccleston, star of films like Shallow Grave and The Others, has been confirmed as the new Doctor Who. Former pop star Billie Piper has been chosen to play his sidekick Rose Tyler.